The recently completed state budget was the first real test of the new New York State Assembly Speaker Carl Heastie’s leadership, who became the leader of that house in early February. By the time the state budget was voted on, Heastie, the 47-year-old accountant and former budget analyst from the Bronx, elected to the Assembly in 2000, had been in his new job for less than two months. 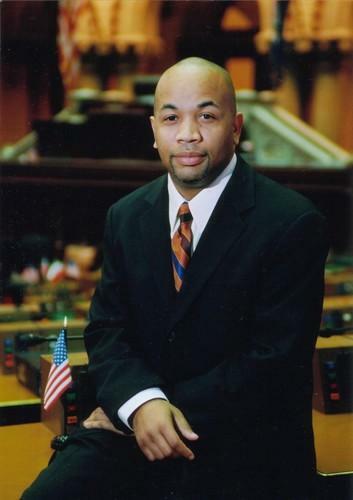 Heastie was elected Speaker on February 3 after the long time Speaker, Sheldon Silver, resigned. Silver was arrested and charged with running a multimillion dollar corruption scheme. “Make no mistake, today we begin a new chapter for the New York State Assembly,” Heastie said in his first comments. From the beginning, Heastie said he’d be different kind of speaker, and lead from the bottom up, letting the 105-member Democratic conference be his guide in budget negotiations. The answer he gave when asked about the possibility of the Assembly approving mixed martial arts in New York is typical of his self-effacing style. Heastie backs legalizing the sport; the previous speaker did not. Assemblyman Sean Ryan, from Lackawanna, was elected to the Assembly in 2012, 18 years into former Speaker Silver’s term. He says he was surprised at the lack of influence most rank and file members had, when he first attended the closed door party conferences where major decisions are made. He calls the atmosphere under the new speaker a “sea change,” and says Heastie served as a “head negotiator” for the Democrats, bringing their positions back to New York Governor Andrew Cuomo. Heastie was more forceful in his opinions when he spoke out against Governor Cuomo’s practice of linking numerous unrelated items to the budget, including criminal justice reforms, and education policy changes. “Legislators should not have to negotiate a budget under threats,” Heastie said, in a March 11 interview with public radio and television. “This is America. 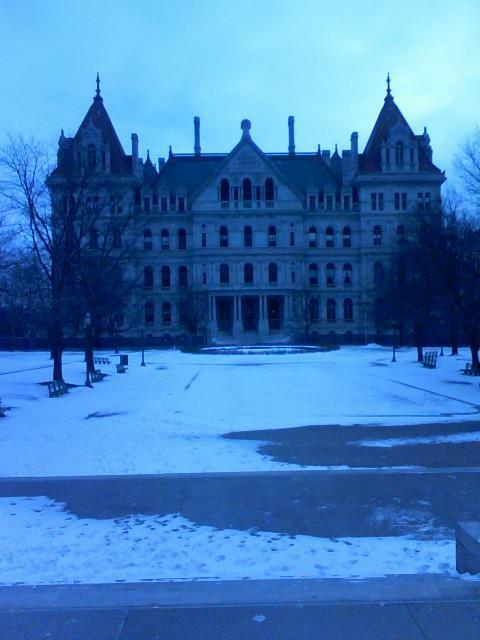 This is New York state." In the end, Cuomo dropped nearly all of the extra items from the budget. And it was Speaker Heastie who announced the budget agreement, before even Governor Cuomo had issued a statement. But Heastie and Assembly Democrats were bested by Cuomo when they were forced to accept a new teacher evaluation and tenure plan that is an anathema to their allies, the teachers’ union. And, when the extra measures were decoupled from the budget, it meant priority items for the Assembly like the DREAM Act, to give college aid to immigrants, and raising the minimum wage, were also stalled. The new speaker has the remainder of the session to try for those issues, as well as win renewal of New York City’s large and complex rent regulation structure, which sunsets in June. Former veteran Assemblyman Richard Brodsky, who is now a fellow at the Demos think-tank and at NYU’s Wagner School, says Heastie passed his first test. “I think he did quite well,” Brodsky said. Brodsky says the first two months for Heastie have focused on the “inside baseball,” of the budget machinations. He says the next step for the new speaker, who was little-known to the public before his election, and who is rather media shy, will be to work to “repair the image” of the assembly, which has been damaged by corruption scandals. Heastie may also need to repair his relationship with Governor Cuomo. In the end, the Assembly broke the governor’s proud string of on-time budgets, by finishing three hours into the new fiscal year. Many Democrats were uneasy with the governor’s new education policies, and, in a six-hour debate the speaker allowed them all to have their say. Assembly Speaker Carl Heastie gave his first broadcast interview to public radio and television. In it, he expressed his frustrations over New York Governor Andrew Cuomo’s decision to link numerous unrelated items to the state budget. Both the Assembly and the Senate significantly increase school aid spending from Governor Cuomo’s budget, with the Assembly recommending a $1.8 billion increase, and the Senate prosing $1.9 billion more. 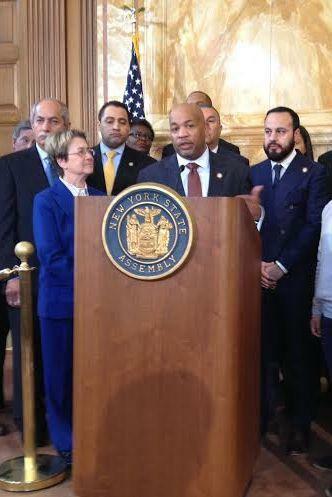 Newly elected New York State Assembly Speaker Carl Heastie made clear one of his top priorities in his first news conference, where he called for passage of the Dream Act, which would offer college aid to children of undocumented immigrants. ..::WAMC Photo by Dave Lucas::.. The top Democrat in the Senate says the state's $5 billion windfall from financial settlements should pay for housing, transportation and school upgrades and tax rebates for low-paid workers. Senate Minority Leader Andrea Stewart-Cousins announced the plan Thursday.